IOS App Developer: FutureSoft, Inc.
Best audio Bible ever made! I have had a reading comprehension problem topped with a sprinkle of dyslexia. Needless to say audio books have been a God send for myself over the past 30 years. I have listened to anywhere from (9-11) different versions of The Bible on audio. In my opinion there’s not even a close second. Must purchase more than once!? I have been charged $19.99 AGAIN for the app. How wrong is this for a Bible! Audio quality was cut in a half. Don’t get this app. Get the original ebook from the audible app. Sacrificing the quality of the audio makes absolutely no sense. App has great potential BUT.... I purchased the New King James study bible. 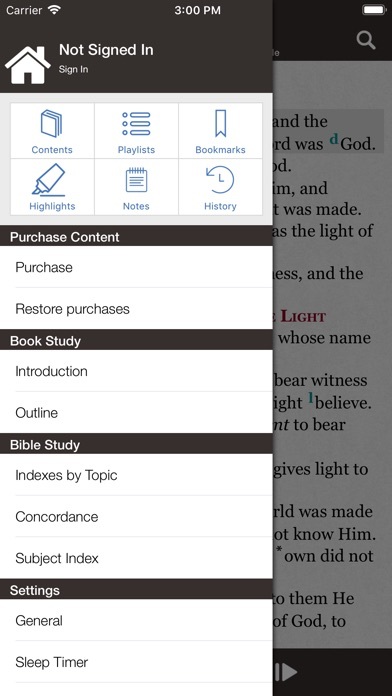 Lots of helpful resources...HOWEVER there is a major problem with toggling between bible text and app resources such as : bible book introductions book outlines Indexes by topic Concordance Subject index Once a resources is accessed and you click on any bible verse link provided you are taken off the page you are on and to the Bible text. You must then navigate your way back to the resource and scroll down to find where you were reading. NO BACK BOTTON PROVIDED. Very disruptive to any line of thinking and study. 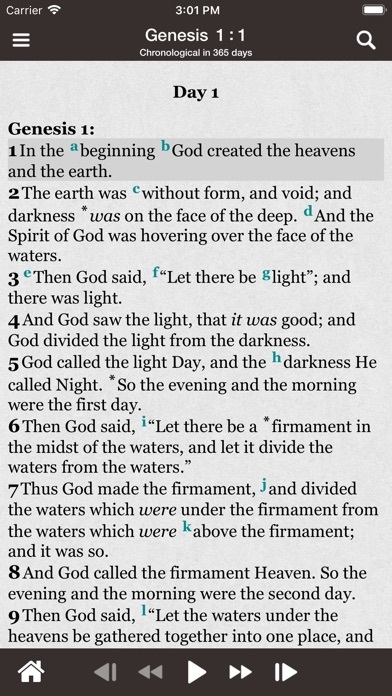 The resources mentioned above are rich with many bible verses so being taken to the verse with no way to quickly ( back button) return to where you were reading is defeating the purpose of linking the two thoughts together as one . It can be done if you hold your thought , read the associated verse, navigate back to the page ,scroll down to try to find where you were reading and then remember what the verse said to apply it in context. And repeat the process many times due to the great volume of verses supplied... even multiple verse links in one sentence. This procedure defeats the ease of use this app should provide to help accomplish its purpose. 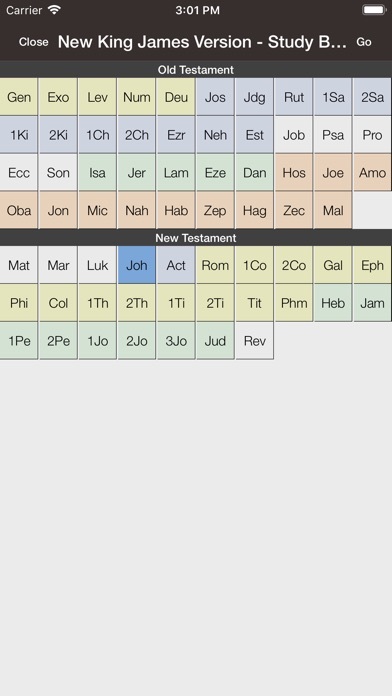 If you have not purchased this app hopefully ( not sure if possible with nkj study bible ) you can get a sample ( I think the book or a chapter from John) to try out the resources I mentioned to see for yourself why a back button is critical. 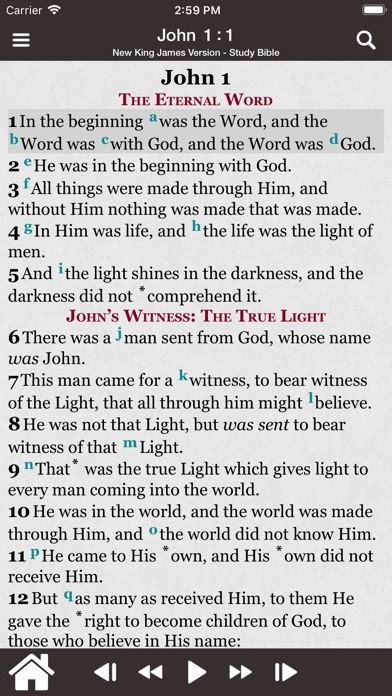 There is a “tree” feature which is excellent and splits the page so you can see both the Bible text and the selected resource AT THE SAME TIME. But there are limited resources to choose from while using the tree and none of those mentioned above. Why all the resources are not available on the tree feature I don’t know. I contacted customer service and they said that the developers were aware of the problem but did not mention if or when a fix update would be released. I will submit an updated review with a much higher rating. When a back button or ALL RESOURCES are added to the tree feature. All it needs now is CarPlay support. 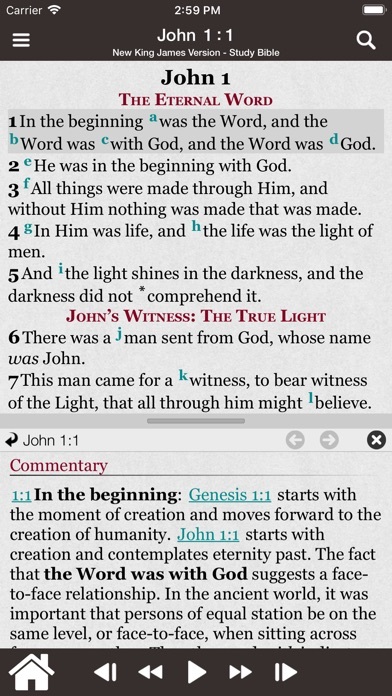 The app will draw you deeper into the Word of God. It will open your eyes the the ENTIRE story of who God is and his character. Please buy it. I bought it and listened to the entire Bible. Genesis to Revelations. Wow I learned so much. You must set a time daily for Gods Word so you don’t get lazy. I commute 1 hour so that was my audio Bible time in my car via Bluetooth. You can also listen off your phone with ear headphones. Excellent Excellent! God will open your eyes and ears in a new way you never thought before. I listen to the Bible while I commute to work or on the weekends at home. It’s very dynamic and fun to listen to the Bible and it almost feels like watching a movie. Is a great app! I have enjoyed it for several years now. However, in the last month or two, it has this glitch that whenever I open the app the audio automatically starts playing whatever passage I was reading last. This can be very disruptive as this is happened during a church service two weeks ago!! This needs to be fixed so that it plays only when I hit the play button. My words will not be able to describe the quality of this Audio Bible, it’s a blessing, I downloaded and I couldn’t stop listening until I finished the whole Book of John ,i will purchase the whole Bible and i know this will be money well spent cause i need The Word every day . More IOS Apps by FutureSoft, Inc.